Hi guys! Honestly, I was feeling a bit burnt out and uninspired last week. Instead of giving you some lackluster work, I decided to take a little time off for some TLC. 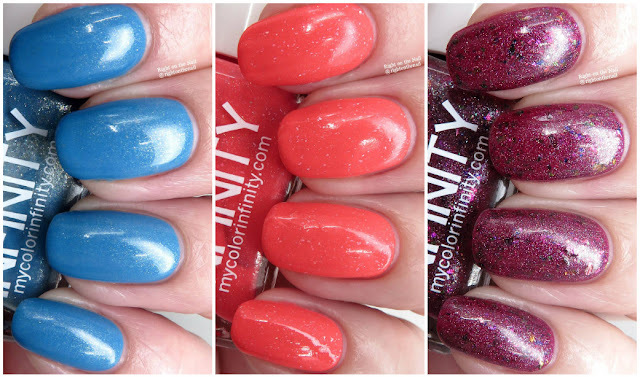 Tonight I have a new brand on the blog, and Color Infinity has been on my radar since their debut at the end of 2017. Their April collection was inspired by birds of paradise, and I knew I was buying the collection. It's a 5-piece collection with a variety of colors and finishes. Their bottles are 12 mL, but I think they used to be smaller. There is a new collection released each month with a pre-order, and if there are any overpours, they are released at the beginning of the next month's release. These colors are currently not available, but make sure to check the website on May 25th for the overpour. Shall we get a closer look? The first thing I noticed about Blue Macaw was the abundance of shimmer...so much that it worried me a bit. A large amount of the shimmer had settled to the side and didn't seem to want to stay suspended. I wanted as much shimmer as possible so I turned the bottle upside down. When I went to apply the polish, the entire brush was clumpy with shimmer. I gave the polish time to allow the shimmer to settle, and then I applied like normal. I ended up emailing Color Infinity about this, and they claim this is normal and not to turn the bottle upside down because there's enough shimmer in there even with settling. I personally prefer polishes with particles that stay suspended for at least a day, but that's just my preference. Blue Macaw is a bright aqua blue base with shimmer. It's a very pretty color that applied well after the clumping issue went away. I had no issues with staining of the nail or cuticle area. Little known fact, I love flamingos. The NC zoo has a bunch of them and I always spend a lot of time watching them. Chilean Flamingo is a neon coral crelly base with holographic flakes and shimmer. It dried slightly dull since it is a neon, but that was easily remedied with a simple coat of topcoat. Wonderful color with a wonderful formula. It dried quickly with no texture. I used 3 thin coats for the photos, but you may be able to get away with 2 depending on your application. And lastly, we have Keel-Billed Toucan which is a berry purple jelly base with loads of UCC flakes. This was the first color I saw on Instagram, and I was drawn in by the flakes. You know how I am. I used 3 thin coats for full coverage, but you may get away with 2. It dried with slight texture, but a coat of topcoat smoothed it all away. I had 1 stray flake that stood up, but it was just a fluke. So far I've been really impressed with Color Infinity! The May Neon Crayon Collection is open for pre-order from May 25-June 4 with a discounted price of $30 ($1 off each color) if you buy the set. Make sure to check back on May 25th for the overpour from the Birds of Paradise Collection. The only one I'm on the fence about is Blue Macaw because of the shimmer, but it's still a beautiful color. You can find out more about Color Infinity on their website, Facebook page, Facebook Group, or Instagram pages.